This tour is a metal fan’s dream. The newly renovated Sound Academy in Toronto was put to the test with a night of moshing when two of the “Big Four” of ‘80s thrash metal, Slayer and Anthrax, took the stage on September 12. The opening act, Death Angel, kicked off the night, ripping through an intense set of riff-laden thrash with Rob Cavestary and Ted Aguilar sharing the lead duties. As one of the forerunners of the early ‘80s Bay Area thrash scene, they definitely know how to get the crowd going. Next up was New York’s Anthrax— a band that became known as one of the earliest members of the thrash metal scene with their first album, Fistful Of Metal, in 1984. In support of their newest release, For All Kings, the five-piece group hit the stage full throttle with “You Gotta Believe” and “Monster At The End” before launching into the classic, “Caught in a Mosh” from their 1987 album, Among The Living, (a must-have for any metal head). They continued through the set with with Joey Belladonna belting out on vocals, Scott Ian and Jon Donais ripping it up on the guitars, and Frank Bello and Charlie Benante holding down and pumping out a solid bottom. After the first two groups took the stage, it was time for the main event. Having personally seen Slayer several times over their 35 year reign, I can confirm that they’re still as much of a powerhouse as ever. They opened their set with “Repentless” off their newest album of the same name—and their fans went wild. 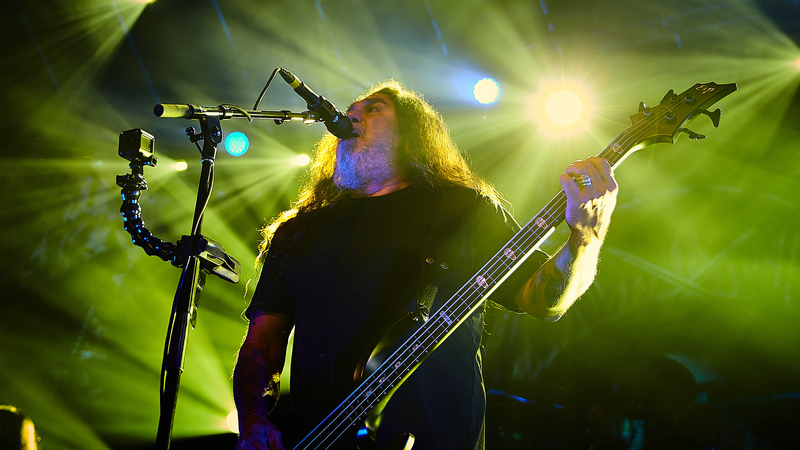 Vocalist/bassist Tom Araya proved that he’s still able to crank it out. Kerry King and Gary Holt screamed through lead after lead and riff after riff in a nuclear assault of tunage, and Paul Bostaph was like a machine gun with a barrage of double bass work that melted everyone’s face off from beginning to end. Their set contained pretty much everything that any fan of Slayer would want to hear, including classics such as “Black Magic,” “The Antichrist,” “Hell Awaits,” “Mandatory Suicide,” and “Raining Blood,” as well as their newer releases like “You Against You”. To wrap it all up, they ended the insane night of headbanging fun with the immensely popular “Angel of Death”. This is definitely a tour that any fan of thrash/speed metal should have on their must see list. Check out the photos below and make sure to track Slayer to ensure that you don't miss them when they come to a city near you!